If the Buffalo Bandits were going to figure out a way to get to the top of the National Lacrosse League standings, some new faces were needed. Coach Darris Kilgour thought he knew who one of them was. Therefore, he completed a three-way trade in July of 2007 that changed the face of his team. The object of Buffalo's affections was forward Sean Greenhalgh, a top scorer. Calgary sent defenseman Taylor Wray to Philadelphia, and a first- (2007) and second-round (2008) draft pick to Buffalo. The Bandits sent goalie Steve Dietrich and All-Star defenseman Kyle Couling to Calgary, and forward Jason Crosbie and other considerations to Philadelphia. Greenhalgh went to Buffalo from Philadelphia, while the Wings sent Ian Llord to Calgary. Giving up Dietrich, a proven top goalie, was a gamble, but he had battled injury problems and Mike Thompson was thought to be ready to take the next step up. Greenhalgh had led the Wings in scoring in the previous two seasons. "That group had been together four or five years and we had a couple kicks at the can but didn't get it done," captain Rich Kilgour said. "It's the same in any sport. If you're not getting better you're geting worse." The Bandits suffered through another death of a part of their past that same month. Bob "Buff" McCready died at the age of 67. McCready was the team's first head coach, but was replaced, in a manner of speaking, by Les Bartley after the third game of the 1992 season. McCready is a member of the Ontario and Canadian Lacrosse Halls of Fame. Concerning the league, the Boston Blazers jumped through all sorts of hoops in the offseason. The Blazers were introduced as an expansion team for 2008, and went through the process of an expansion draft on July 30. Buffalo lost forward Brenden Thenhaus to the Blazers in the procedure. The Bandits went back to work on their roster at draft time in September. Llord turned up in a Buffalo uniform after a first- and second-round pick were sent to Calgary for Llord and a third-rounder. Minnesota sent the rights to Brandon Swamp for a 2008 first-round pick. Goalie Ken Montour came over from Philadelphia for a third-round choice. The Bandits then completed four other deals, all involving swaps of draft choices either in 2007 or 2008. For a while in October, all of that work to revamp the roster looked like it would be for naught. The league and its players couldn't get together on a collective bargaining agreement, and the NLL even announced on Oct. 16 that it had cancelled the season. Nine days later, though, the season was saved through some after-the-last-second negotiations. Boston opted to wait another year to start operations, and Arizona decided to not play in 2008 either. The dispersal draft of the players on the two teams was held on November 6. 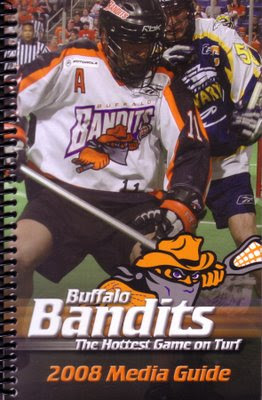 The Bandits rolled the dice by taking Arizona's Craig Conn, who had an injured knee and didn't figure to play much if at all in 2008. What's more, if Arizona returned to the league for 2009, Conn's rights would go right back to the Desert. 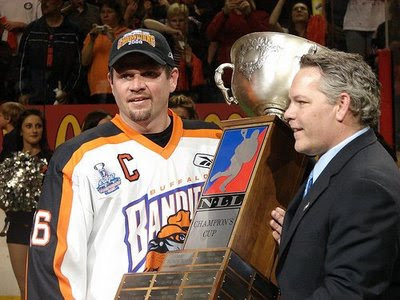 Brian Croswell and Joe Smith joined the Bandits in later rounds. Could we play lacrosse now? Most could. But Greenhalgh blew out his knee during a workout before Christmas, and would miss the entire 2008 season. "That was pretty disappointing, to say the least," Kilgour said. "He's somebody I had really coveted. I'd made a move to go get him and he'd looked excellent. And now it's not going to work out." That season began on January 11, as the Bandits played the Rochester Knighthawks on consecutive nights. Buffalo opened with a 12-9 loss, and Kilgour split the goaltending duties between Ken Montour and Mike Thompson. We'd see plenty of that in the season to come. "We were disorganized, we had bad passing and the power play was horrible," John Tavares said about the game. The Bandits rebounded the next night to win in Rochester to snap the Knighthawks' 16-game winning streak. However, they got off to another relatively slow start -- something that had haunted them in the past two seasons. One of the few early highlights came when Tavares scored his 597th career goal against New York, breaking Gary Gait's league record. "He scores quality and quantity," said Rich Kilgour, a teammate from Day One. "Obviously he's the greatest of all time, there's no debating that. He's the best all-around lacrosse player that has ever strapped it up in this league. He deserves it." Buffalo dropped overtime decisions in Philadelphia on January 26 and in New York on February 10. That made it 10 losses in 11 games with extra time, all away from home. When the Bandits lost in Toronto on February 15, they were 3-4 and in a bit of trouble in the divisional race. Injuries were part of the problem. Brett Bucktooth was in the midst of missing most of the regular season with a hip injury, while Roger Vyse and Kevin Dostie missed a few games as well. But Buffalo got better from that point on. The Bandits got a big 16-14 win from undefeated Minnesota on February 16, as Cory Bomberry and Mark Steenhuis scored in the final three minutes. "Given the circumstances, that was an absolutely huge win that we had to have against a really good team playing at its best," Darris Kilgour said. The game started a four-game win streak, including victories over Chicago, undefeated Philadelphia and Minnesota again. That put the team's record at 7-4. It hit a small bump in the road with losses to Toronto and Rochester. In-between the two losses, the Bandits completed a major trade. They brought Mike Accursi back to Buffalo in exchange for Dan Teat, a second-rounder in 2008 and a first-rounder in 2009. The 13-9 loss to Toronto on March 23 was a damaging one. After splitting games with Colorado and Rochester, Buffalo faced two crucial games at the end of the season just to qualify for the postseason at least. The Bandits came through, beat Chicago (Accursi with four first-half goals) and Portland to finish at 10-6. Against the LumberJax, Tavares had three straight goals to break the game open. "He's a legend, the ageless wonder," Steenhuis said. "It's amazing for us to see it and be a part of it." That was a popular record, as three other teams in the division also ended at 10-6. When the accountants were done going over the tiebreakers, Buffalo had won the East and thus the home-field advantage throughout the playoffs. No team in the West was better than 9-7. Individually, Tavares finished with 87 points and Mark Steenhuis had 75. Both were named to the first all-pro team, and Steenhuis was picked as transition player of the year. Dostie was third on the team in goals with 22, while Delby Powless and Cory Bomberry had 55 points each. Thompson had a better won-loss record than Montour (5-1 to 4-5), but Montour had the better goals-against average (10.23 to 11.81). The Bandits started the playoffs at home against Philadelphia on May 2. Accursi had four goals while Thompson was sharp in the net in a 14-12 victory. The Bandits scored three straight goals in the fourth quarter to gain breathing room. "In the fourth quarter I think the boys just said, 'You know what, this is our season.' It really hit us in the face that this could be our last game if we don't straighten it out and get to work," Darris Kilgour said. In the East final against New York on May 10, Steenhuis took over. He had seven goals, while Bucktooth and Dostie had three each and Tavares had two goals and 10 assists. That was more than enough in a 19-12 win. "It was magical just watching [Steenhuis} shoot the ball so effortlessly," Bucktooth said. "When a guy is hot like that, just get him the ball and let him take care of business." Over in the West, Portland had overcome a poor regular season and stunned everyone by advancing to the May 17 final. You'd think the Bandits would have an easy time with a team that had gone 6-10 in the regular season. But the LumberJax proved to be a handful. The game went back and forth throughout the night, in part because the Bandits lost Chris White to a injury early in the contest. Steenhuis had a huge game with five goals, and Dostie added three more. Buffalo had the lead, 14-13, in the final seconds when Thompson made one last huge save on Peter Jacobs from 15 feet away. The Bandits ran out the rest of the clock and started to celebrate their fourth championship and their first since 1996. "They had a great opportunity and Mike stopped it," said Darris Kilgour. "That's the one everybody will remember but Mikey made just so many big saves for us all night long." The Bandits had knocked on the door for a long time. Finally, they barged in.